5/5 – Ring Mag #6 Strawweight Riku Kanu was knocked out by unrated Jerry Tomogdan at 1:56 of the 6th round at the Bunka Center in Japan. Kanu was dropped in the 4th round and again in the 6th. Tomogdon entered the fight with 8 losses and had only won 4 of his last 9 bouts. 5/6 – Ring Mag #8 Lb 4 LB & Middleweight champ Canelo Alvarez dominated unrated Julio Cesar Chavez Jr in a fight that failed to live up to the hype of former Mexican vs Mexican action packed affairs. The fight took place at the T Mobile Arena in Las Vegas, NV at a catchweight of 164.5 lbs with Alvarez winning a 12 rd UD by the scores of 120-108 across the board. Chavez Jr simply failed to throw enough punches, while Alvarez had no trouble landing at will. The crowd booed Chavez Jr’s effort. Alvarez has now won 7 straight since his lone loss, a 12 rd UD vs Floyd Mayweather in 2013. After the fight GGG made his ringwalk with his ring entrance playing and it was announced that GGG vs Canelo will take place on September 16th at a site to be determined. 5/6 – On the undercard of Alvarez/Chavez Jr, Ring Mag #3 Middleweight David Lemieux won a 10 rd UD over unrated, but game Marco Reyes by the scores of 99-90 twice and 99-91. Lemieux landed power shots throughout the match that would have stopped most opponents, but Reyes was simply too tough for his own good. Lemieux has now won 13 of 14 including 4 straight since his last loss in 2015 to GGG. 5/6 – Also on the undercard of Alvarez/Chavez Jr, Ring Mag #8 Featherweight Joseph Diaz handed unrated Manuel Avila his 1st defeat by 10 rd UD by the scores of 100-90 & 99-91 twice. Diaz, a 2012 US Olympian, was in control throughout and has now gone the distance in B2B fights. 5/6 – Ring Mag #6 Heavyweight & WBO Champ Joseph Parker successfully defended his title for the 1st time, defeating unrated unrated Razvan Cojanu by 12 rd UD by the scores of 119-108 & 117-110 twice at the Vector Arena in Auckland, New Zealand. Parker was in control throughout against his former sparring partner, who took the fight on 2 weeks’ notice after Parker’s original opponent, Hughie Fury, withdrew after a back injury during training. The undefeated Parker has now gone the distance in B2B fights. 5/9 – The World Boxing Super Series announced that the Cruiserweight and Super Middleweight divisions will be featured in the tournament that will get underway in September. 5/13 – Ring Mag #6 & WBA Jr Bantamweight champ Khalid Yafai made a successful 1st defense of his title, winning a 12 rd UD over unrated Suguru Muranaka by the scores of 119-107 twice & 118-108 at the Barclaycard Arena in Birmingham, West Midland UK. Yafei scored a knockdown in the 2nd round, but Muranaka was able to rise and last the distance. Yafai has now gone 12 rds in B2B fights after having won 5 of his last 6 prior inside the distance. Muranaka was fighting for the 1st time outside of Japan and his 19 fight win streak snapped. 5/13 – James Toney, the former IBF Middleweight, IBF Super Middleweight, and IBF Cruiserweight World Champion announced his retirement following a 6th rd KO at the Eastern Michigan Convocation Center. The future Hall of Famer has a record of 77-10-3, with 47 KO’s and was never stopped. 5/18 – Ring Mag #6 Jr Featherweight Diego De La Hoya won a nondescript 10 rd UD over unrated Erik Ruiz at the Casino Del Sol in Tucson, Arizona by the scores of 100-90 twice & 99-91. The outcome was never in doubt as De La Hoya was far superior. His last 3 fights have gone the distance. 5/19 – Ring Mag #1 Welterweight, WBA & WBC champion Keith Thurman had surgery recently on his right elbow to remove calcium deposits and will be out for the remainder of the year. 5/20 – Ring Mag #5 pound for pound, Ring Mag, WBC & WBO Jr Welterweight Champion Terence “Bud” Crawford successfully defended his Ring Mag & WBC titles for the 2nd time and his WBO title for the 5th time when he stopped unrated 2008 Olympic Gold medalist Felix Diaz at Madison Square Garden in New York. Crawford was in control throughout and Diaz’s face was badly swollen and he was having trouble seeing, causing his corner to throw in the towel following the 10th round. Crawford has now stopped 5 of his last 6 foes including B2B opponents. 5/20 – On the undercard of Crawford/Diaz, Ring Mag #10 Lightweight Reymundo Beltran stopped unrated Jonathan Maicelo at 1:25 of the 2nd round. An off-balance Beltran was dropped in the 1st round, but a left hook upstairs knocked Maicelo out cold, and he was taken from the ring on a stretcher. Beltran has now won 4 straight, all by knockout. 5/20 – Ring Mag #6 Jr Lightweight & IBF champ Gervonta Davis successfully defended his title for the 1st time, stopping unrated, but undefeated Liam Walsh at 2:11 of the 3rd rd at the Copper Box Arena in London, England. The 1st 2 round were merely feeling out, but Davis’ power was too much for Walsh to overcome in front of his home town crowd. A left upstairs dropped Walsh, who rose on unsteady legs, and Davis’ follow up attack prompted referee in charge Michael Alexander. Davis recorded his 9th straight knockout. 5/20 – Ring Mag #2 Featherweight & champ Gary Russell Jr successfully defended his title for the 2nd time with a 7th rd TKO over unrated Oscar Escandon at the MGM National Harbor in Oxon Hill, Md. Russell scored a knockdown in the 3rd round and had Escandon hurt and vulnerable in the 7th, when referee in charge Harvey Dock intervened and stopped the contest at :59 into the round. Russell has now won 4 straight since his lone loss to Vasyl Lomachenko in 2014, with 3 straight KO’s. 5/20 – On the undercard of Russell/Oscandon, Ring Mag #4 Super Middleweight Andre Dirrell won the interim IBF title after beating unrated Jose Uzcategui by DQ. Uzcategui landed a hook that dropped Dirrell a split second after the 8th round bell sounded and referee in charge Bill Clancy decided on the DQ, rather than go to the scorecards, which had Uzcategui up by the scores of 77-75, 77-74, & 76-76. Chaos ensued afterward when Dirrell’s uncle sucker punched Uzcategui in the ring after Andre had came over and told Uzcategui that he forgave him for hitting him late. Uzcategui appeared to in motion when the bell sounded so the punch that dropped Dirrell was unintentional. Dirrell has now won 8 of 9 including B2B fights since his last loss, a 12 rd UD to current Ring Mag #1 Super Middleweight & IBF champ James Degale. Uzcategui had his 4 fight win streak snapped, but should be entitled to a rematch due to the controversy surrounding the ending. 5/20 – Ring Mag #4 Jr Flyweight & WBO Champ Kosei Tanaka successfully made the 1st defense of his title with a 12 rd UD over unrated, but undefeated Angel Acosta by the scores of 117-110 twice and 116-111 at Takeda Teva Ocean Arena in Nagoya, Aichi, Japan. It was a hard fought win for Tanaka, who scored a knockdown in the 5th round. The decision win snapped a 3 fight KO streak as he has now stopped 5 of his last 7 foes. The Puerto Rican Acosta had stopped all 16 of his prior foes. 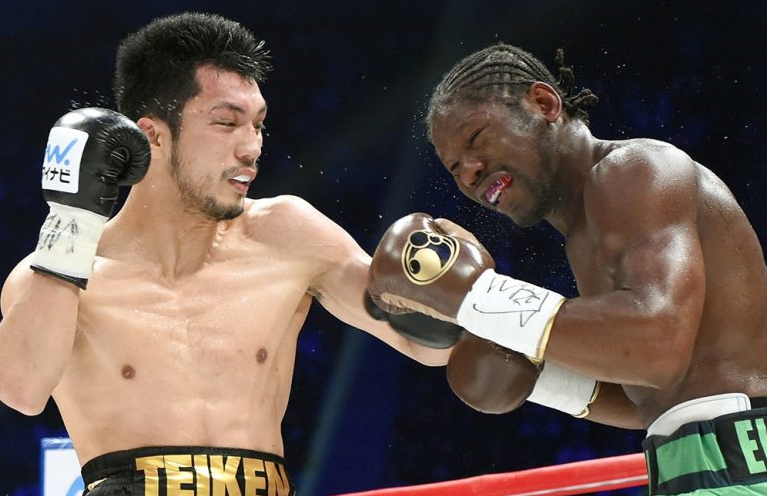 5/20 – In a battle of Top 10 Middleweights, Ring Mag #8 Hassan N’Dam won a highly controversial 12 rd SD over #9 Ryota Murata by the scores of 116-111, 115-112 & 110-117 at the Ariake Colosseum in Tokyo, Japan. N’Dam was dropped near the end of the 4th, which was the only knockdown of the fight. N’Dam holds the interim WBA title (GGG is the real champ) and WBA President Gilberto Jesus Mendoza issued an immediate apology to the Murata team and is demanding a direct rematch. N’Dam has now won 9 of 10 including 5 straight since his last loss, in 2015 to David Lemiuex. Murata, the 2012 Olympic Gold medalist, lost for the 1st time and was a 2.5:1 favorite. The two judges that scored the bout for N’Dam were suspended for 6 months by the WBA. 5/20 – On the undercard of N’Dam/Murata in a battle of top 10 Flyweights, Ring Mag #10 Juan Hernandez was set to make the 1st defense of his WBC title, but was stripped for failing to make weight against #7 Daigo Higa. The title was thus only at stake for Higa, who stopped Hernandez at 2:58 of the 6th rd. Higa scored a knockdown in the 2nd round and dropped Hernandez 4 times in the 6th. Higa has now stopped all 13 of his foes. Hernandez lost for the 1st time since 2011. 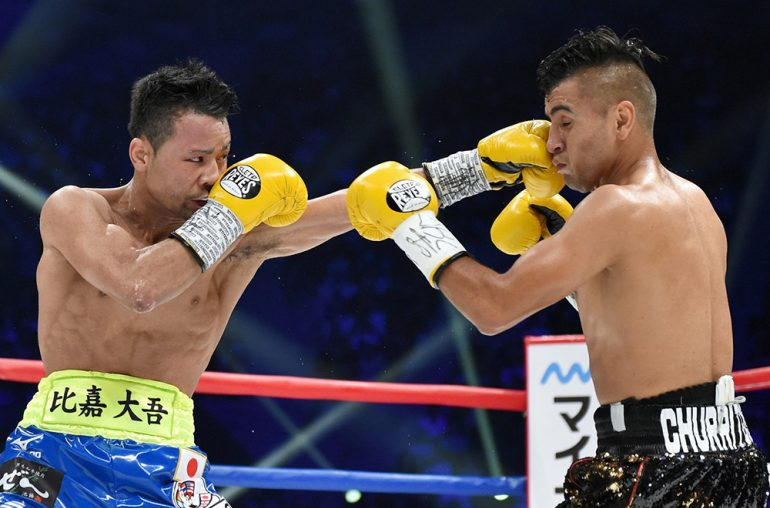 5/20 – Also on the undercard of N’Dam/Murata, in the 3rd fight between top 10 fighters, Ring Mag #3 Jr Flyweight and WBC Champ Ganigan Lopez lost a 12 rd MD to #10 Ken Shiro by the scores of 115-113 twice and 114-114. This was just Shiro’s 10th pro fight. Lopez had his 3 fight win streak snapped as he lost for just the 2nd time in his last 10 fights. 5/20 – Ring Mag #10 Featherweight Jorge Lara ran over unrated Mario Briones, stopping him at :58 of the 3rd rd at the Laredo Energy Arena in Laredo, Tx. Lara was off over a year layoff, as he was shot in the leg during an attempted robbery last year. This was his 4th straight stoppage and he’s stopped 9 of his last 10 overall. 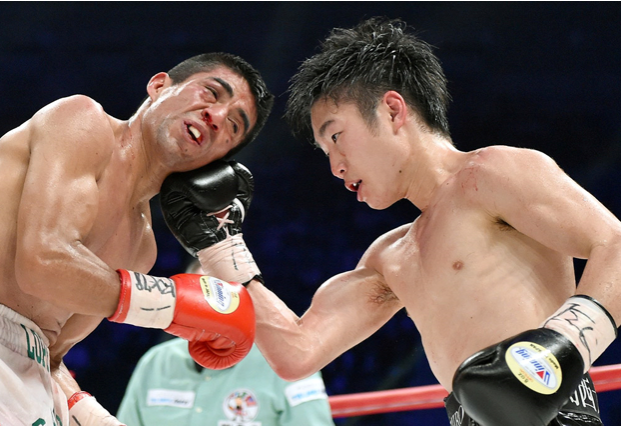 5/21 – Ring Mag #10 Lb 4 Lb, #1 Jr Bantamweight & WBO Champ Naoya Inoue successfully defended his title for the 5th time, stopping unrated Ricardo Rodriguez at 1:08 of the 3rd round at the Ariake Colosseum in Tokyo, Japan. Naoya scored two knockdowns in the 3rd round, the last from a counter left hook that resulted in Rodriguez being counted out. Naoya has now stopped 8 of his last 9 foes, including 3 straight. 5/21 – On the undercard of Inoue/Rodriguez, in a matchup between Top 10 Jr Flyweights, Ring Mag #8 Milan Melindo won the IBF title after stopping Ring Mag #2 Akira Yaegashi at 2:45 of the 1st round. 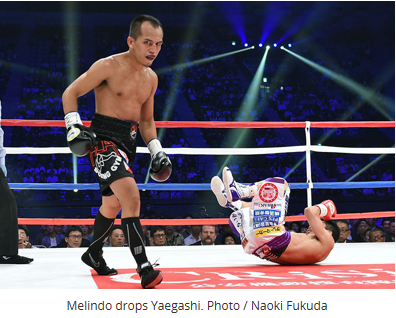 Melindo dropped Yaegashi three times, the first two from left hooks. After the 3rd knockdown, referee in charge Eddie Hernandez immediately waved off the contest. Melindo has now won 7 of 8 including 4 straight since his last loss, a 6 rd TD in 2015. His only 2 losses have come in World Title bouts. Yaegashi had his 5 fight win streak snapped. 5/23 – Ring Mag #8 Straweight Simphiwe Khonco will take on unrated Melvin Jerusalem at Emperor’s Palace in South Africa. Khonco is off a 12 rd UD over Nkosinathi Joyi last November. He’s won 11 of 12 incl B2B since his last loss, a 12 rd UD vs current Ring Mag #9 Jr Flyweight Hekkie Budler in a straweight match in 2015. Jerusalem is off his 1st loss, a closely contested 12 rd UD loss against current Ring Mag #1 Straweight & WBC champ Wanheng Menayothin aka Chayaphon Moonsri on Jan 25th. The fight was so close that had Jerusalem not had a point deducted for a low blow, the fight would have ended in a draw. 5/24 – Two-time WBO Super Middleweight champion Robert Stieglitz announced his retirement. He ends his career with a record of 50-5-2, 29 KO’s. 5/27 – In a battle of Top 10 Welterweights, Ring Mag #7 Errol Spence stopped #2 & IBF Champ Kell Brook at 1:47 of the 11th round at the Bramall Lane Football Ground in Sheffield, Yorkshire, UK. Brook controlled the pace early with his slick movement and effective punching, but Spence took control starting in the 6th round. Spence scored a knockdown from an accumulation of punches in the 10th round, but Brook got up and gave just as good as he got the remainder of the round. 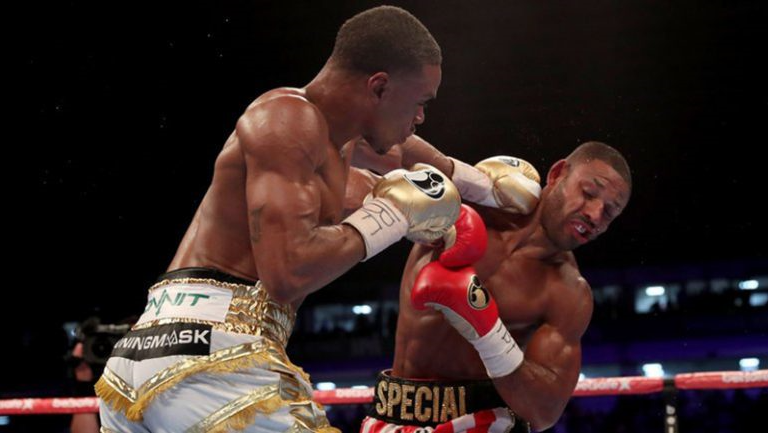 Spence’s jab forced a significant sized welt under the left eye of Brook, which caused him to take a knee in the 11th and then stay down, unwilling to continue due to blurred vision. It was later revealed that Brook suffered a broken eye socket, which was the same injury he suffered to his right eye in his previous fight against GGG. Spence has now stopped 12 of his last 13 foes, including 9 straight. Brook has now suffered B2B defeats as he lost his prior fight attempting to win the Middleweight title against GGG. 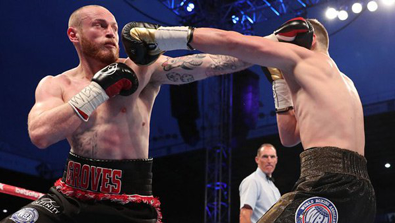 5/27 – On the undercard of Brook/Spence, Ring Mag #3 Super Middleweight George Groves stopped #8 Fedor Chudinov at 1:14 of the 6th round for the vacant WBA Super Middleweight title. The fight was action packed as Chudinov’s aggressive style meshed well with the movement and faster hands of Groves. An accidental clash of heads in the 4th round resulted in Groves having a cut on his left eye. In the 6th Groves landed a combination that hurt Chudinov and followed that up with another flurry that Chudinov had no answer for and wasn’t throwing back, forcing referee in charge Steve Gray to stop the contest. Groves also fought through a broken jaw. This is the 1st World Title for Groves, who had lost his 3 prior attempts. Groves has now won 5 straight. Chudinov has now lost B2B fights. 5/27 – Ring Mag #2 Jr Lightweight Orlando Salido stopped unrated Aristedas Perez in Bacum, Sonora, Mexico when Perez failed to come out for the 8th round. Salido was actually dropped in the 3rd round, but was in total control aside from that. Salido had his 3 fight winless streak snapped, dating back to 2014. 5/27 – Ring Mag #4 Bantamweight Anselmo Moreno moved up to Jr Featherweight and was stopped at 2:32 of the 3rd round by unrated Julio Ceja at the Amador Convention Center in Panama City, Panama in a WBC eliminator. Moreno was dropped for the count from a left uppercut. Ceja lost the WBC Title in his previous fight and has now won 6 of 7. Moreno has now lost 4 of his last 5. Ceja is now in line to take on Ring Mag #3 and WBC Champion Rey Vargas. 5/27 – On the undercard of Moreno/Ceja, Ring Mag #7 Straweight Saul Juarez lost a 12 rd UD against unrated Leroy Estrada in a WBC eliminator. Estrada survived a 9th round knockdown and won by the scores of 117-110 twice and 115-112. Estrada has won 9 of 10, while Juarez has lost B2B fights. Estrada is now in line to meet Ring Mag #1 & WBC Champ Wanheng Menayothin aka Chayaphon Moonsri, who must 1st get by his title defense on June 3rd. 5/27 – Ring Mag #4 Strawweight and IBF Champion Jose Argumedo successfully defended his title for the 3rd time, stopping unrated Gabriel Mendoza at :43 of the 8th round in Monterrey, Nuevo Leon, Mexico. The bout was called off on the doctors advice due to a cut over Mendoza’s left eye that was caused from a punch. With the win, Argumedo has now won 12 of 13 including 6 in a row. This was the 1st time Mendoza had been stopped.